Your DealerRater Social Marketing platform includes a powerful new feature for promoting your dealership on Google. We've integrated with Google Posts so you can now create and share timely, relevant content directly to Google Search and Maps. 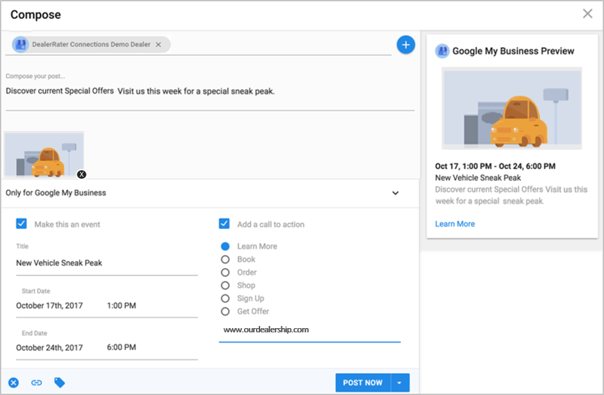 Use Google Posts to drive traffic to your sales, specials or new services, and create urgency with adding event start and end dates. 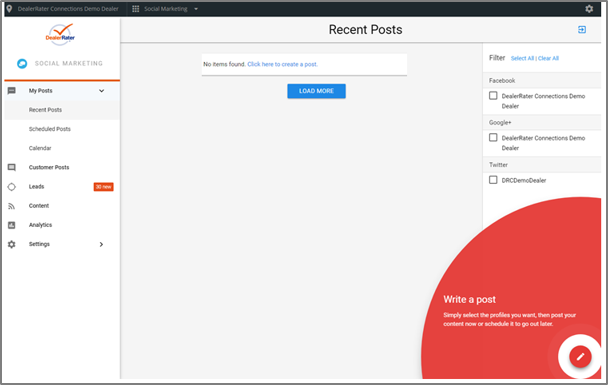 Your posts include an image, your text, and a call to action button that you can link to any URL. Log into your Dealer Panel with an account which has administrative access for your dealership. Select "Social Marketing" from the "360 Panel" heading in the navigation bar along the top of the Dealer Panel; you will be directed into your "Social Marketing" platform.